(Oops! As “Saab 95” reminded in the comments – the springs are on the wrong side of the shoes in the photo… They have to be on the inside! 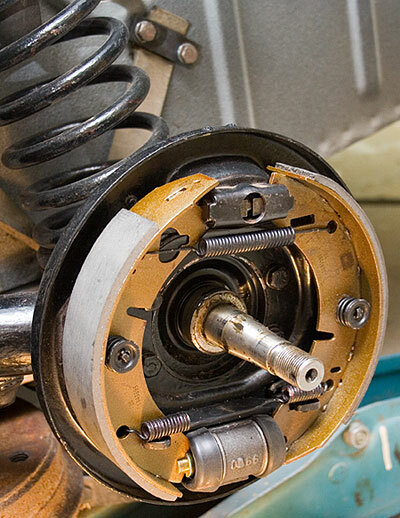 I remembered it as I put the hub on – installed this way the springs will grind against the hub. So I installed them correctly but forgot to take a new photo). New brakelines and new handbrake cables. The drum threads were opened up. Remembered it as soon as I put the hubs on… (the spring touches the hub so it makes a little noise if it’s installed as in that photo). Hi, I and my father inlaw are restoring a -63 two stroke and are struggeling with the brakedrums. How do you get them off? Neither front or rear drums want’s to come off. Great site and project by the way. The drums can get pretty stuck if the car has been standing a long time. Usually for long time storage it would be wise to loosen the shoes from the adjustment screw. Don’t remove the drums by hitting them with a hammer. It usually doesn’t work and may crack them.